Survey the area in which you are practicing yoga, whether it is in the comfort of your own home or in a class and group environment. You want to make sure that there is enough room in between you and the next yoga practitioner so you do not accidentally hit someone, in addition to being able to achieve each stretch and pose to your full capabilities. Yoga involves only a few key items in order to practice it – a mat, as well as any accessories that you might want to include, such as a yoga ball, strap or blocks. Be sure that the mat you choose has a non-slip grip. This is to ensure that your mat does not wear out easily and can handle your movement without sliding around. Read reviews online to find a durable yoga mat. If this is your first time practicing yoga, it is important to consult with a yoga instructor to ensure that you are properly performing the poses. While the Internet can have useful tips for how to perform a pose, use this only as a supplement in addition to what you learn from a trained instructor. This is to ensure that you get the most out of the pose and that you do not injure yourself as well. Moreover, let your instructor know if you have any medical conditions that might prevent you from completing a certain pose. 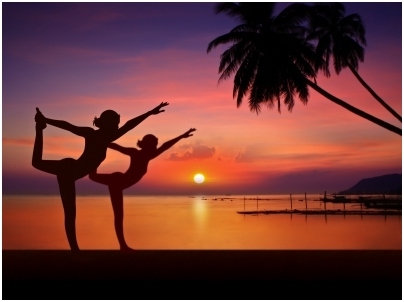 An important component to practicing yoga is to ensure that your mind and body are in sync. Relax – try not to be too stiff or it will be more difficult (and even painful) to achieve a certain pose. Listen to your body – it takes a while to master a certain pose, so do not be deterred if you cannot do it right away. Adjust your pose to the current ability and flexibility of your body, and then work your way up to the pose with practice. Also, talk to your healthcare provider before practicing yoga, especially if you know you have a medical condition, such as osteoporosis or any other back problems, as you can injure yourself with certain yoga poses, while others may actually be of benefit to your condition. As a safety measure, you may want to avoid certain poses, like inversions, which can alter your menstrual flow when you are on your period and lead to a harmful condition such as endometriosis, where uterine cells abnormally grow in other areas aside from the uterus. Start with introductory classes before you transition into more challenging classes, like heat intense Bikram yoga. As there are many types of yoga, you can choose the yoga style that is right for you and your body’s current physical condition. When it comes down to it, it is important to know your limits and listen to your body in order to enjoy all of the health benefits of yoga. Virginia Cunningham is a freelance health writer and very active yoga enthusiast in Southern California. She works alongside with Northwest to educate others about the importance of their personal health, as well as how to practice yoga in the safest conditions.